The Mega Stand Steady Standing Desk Converter is big! As with all of our Stand Steady height adjustable desks, the Mega is comfortable and compatible with your existing work space. 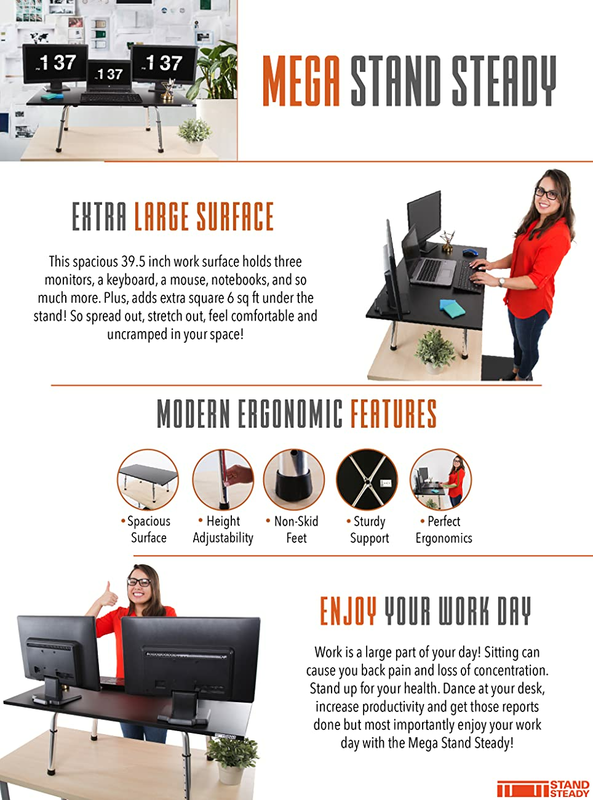 Simply place the Mega on top of your existing desk or tabletop, adjust it to your preferred height, and you are ready to work standing up. We call this "the complete desktop replacement" because it is large enough to completely cover most desks! Plus, you gain over six square feet of usable storage space beneath it. The Stand Steady adjustable standing desk converter is the quickest, easiest, and most cost effective way to stand up for your health and productivity...and the perfect choice for triple screens, or two screens and a laptop! TALLER DESIGN: We heard your feedback and answered the call with a TALLER Original Standing Desk! Featuring six preset heights, your new desktop riser can now adjust from 12 inches to a whopping 18 inches above the desktop. We’ve tested it in our office and this is a perfect range if you are between 5’4” and 6’ 7”. LARGE ERGONOMIC SURFACE: Measuring 39" x 22” (approximately 6 square feet), the sit stand desk converter can be set at a positive or negative tilt for a more personalized fit and better typing comfort. It’s also large enough to fit your triple monitors, keyboard, mouse, snacks, your collection of bobble heads, and more! HIGH QUALITY: Your Original Stand Steady stand up desk converter is so sturdy and stable that it can hold up to 75 evenly distributed pounds (the equivalent weight to 100 cans of beer, 3600 comic books, or an average sized 11-year-old boy)! Plus, the built-in slide-resistant feet will enhance stability. ALLEVIATE NECK AND BACK PAIN: Owners of the Original Stand Steady Standing Desk have reported less neck and back pain, improved posture, and increased productivity. THOUSANDS SOLD: With legions of satisfied customers, you can purchase your stand up desk converter with confidence. Want a different size? Here's the entire range of Stand Steady Original Standing Desk Converters! Perfect! It sits on my desk so I can now have the choice of standing or sitting. Just what I wanted. Very sturdy, 6 height adjustments, perfect! I like it. I wanted to save a little money, so I purchased this one rather than one I could easily raise and lower as needed. It's a decent height with the pegs adjusted all the way down. It's large enough to fit 2 large monitors, my keyboard, mouse & still have room for my paperwork. Mine arrived with some wood damage along the edge, but still completely functional. Works just fine for my needs. Gives me plenty of writing space and room to sort papers and still have storage room underneath. Also adjusts to a perfect height for me to stand and work. Glad I bought it. Feet are not really steady enough. Its pretty wobbly on top of my desk.